(VOVWORLD) -A get-together to mark the 53rd anniversary of Singapore’s National Day took place in Ho Chi Minh City on Wednesday. The event was jointly held by the Ho Chi Minh City Union of Friendship Organizations and the city’s Vietnam-Singapore Friendship Association. Congratulating Singapore on the day, Chairman of Ho Chi Minh City’s Association Nguyen Ngoc Hoa expressed his delight over the fruitful Vietnam-Singapore cooperative relations in various fields, which have been consolidated through regular visits of both sides’ high-level leaders, and meetings on the sidelines of multilateral forums. On the occasion, Hoa called for further support from the Singaporean General Consulate, the Singaporean business association, and the Singaporean community in the city to enhance people-to-people exchange as well as collaboration in culture, sports, and tourism. 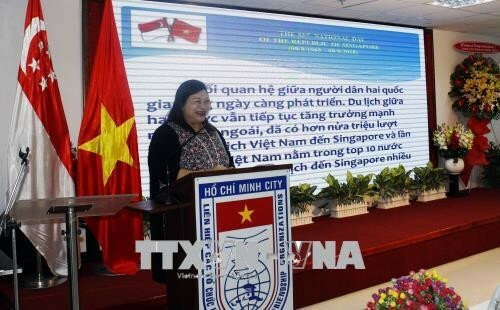 Singaporean Consul General Leow Siu Lin expressed her respect for the cooperation from Ho Chi Minh City Union of Friendship Organizations and the city’s Vietnam-Singapore Friendship Association, which she said contributed significantly to fortifying the close relations between Singaporean people and Ho Chi Minh City’s locals.